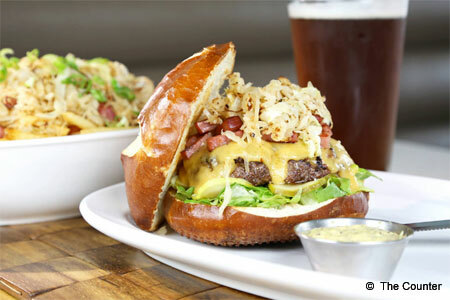 Build-your-own gourmet burger concept works well for foodies with a burger craving. : The Counter presents diners with a checklist on a clipboard instead of a regular menu. Here’s where the fun begins: check off your choice of patty (beef, turkey, chicken, vegan or special market selection), size, toppings, sauce and bun (or no bun) to create your bespoke burger. Want Danish blue cheese or herb goat cheese spread on your giant one-pounder? What about roasted corn and black bean salsa? But even before you wrap your mouth around your juicy burger, start off with the fried dill pickle chips, onion strings or sweet potato fries. For vegetarians, there’s a quinoa and alfalfa sprout-loaded "hippie salad" and a vegan burger with spicy Dijon balsamic sauce. The eatery, with its refreshing industrial décor, mod music, cold beer, cocktails, wines and booze-infused adult milkshakes, also offers sandwiches, fountain drinks, ice cream shakes and desserts such as apple crumble, Key lime pie and brownies. Also located at 6416 Irvine Blvd., Woodbury Town Center, Irvine, 949-336-7272.